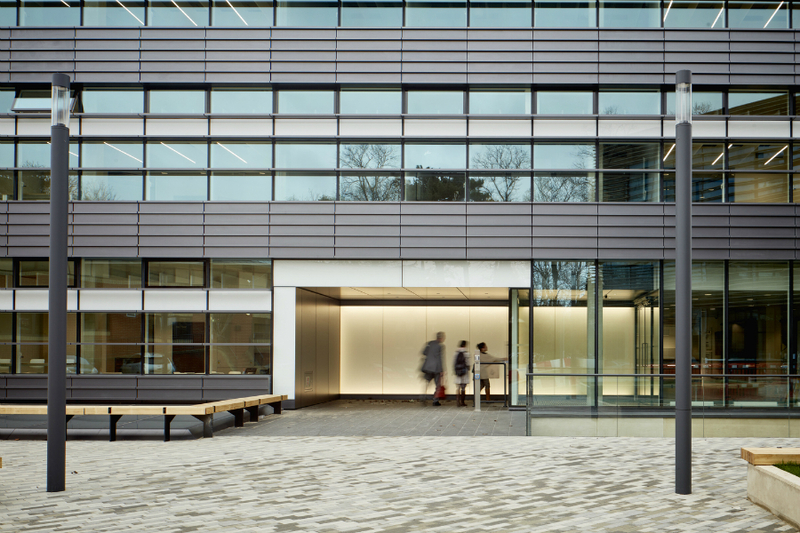 The Big Data Institute, Oxford University’s new world-leading research facility and part of the new Li Ka Shing Centre for Health Information, was opened this month by the Chancellor of the Exchequer, Philip Hammond. 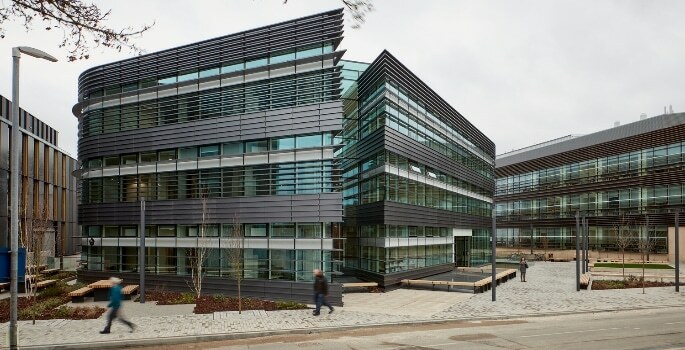 The Big Data Institute is the second phase of the £115 million Li Ka Shing Centre, and sits alongside its sister building The Target Delivery Institute. It is the first centre in the UK for the analysis, integration and interrogation of large complex datasets for research into the causes and consequences, prevention and treatment of disease. The building is a distinctive three storey purpose-built facility for over 500 researchers specialising in high speed data computation. At its hub is a dedicated data centre that has enough computing power to do 600 trillion computations per second. 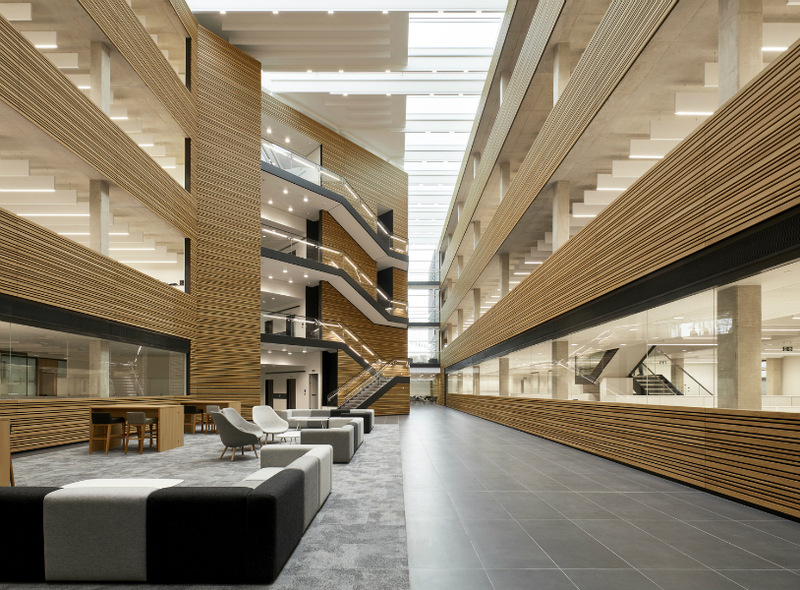 It contains a mix of cellular and open plan offices wrapping around a timber-clad atrium with a glass and steel feature staircase linking the floors. The lower ground floor houses a café, seminar rooms and AV meeting suite, as well as break-out space for researcher interaction. A unique energy-saving feature of the building is the subterranean labyrinth for passive heating and cooling. Outside air is pulled through three separate air corridors totalling one kilometre in length. By the time the air reaches the major roof plant, it has warmed or cooled by up to five degrees, reducing energy costs. Other sustainable and environmental features of the building include a CHP plant, PV panels, sedum roof, sustainable urban drainage system and drainage attenuation, all of which contributed to the project achieving the University’s first ‘Outstanding’ BREEAM rating. International consultancy and construction company Mace provided construction management services on the project. The Big Data Institute is the tenth major project delivered by Mace for Oxford University, and the fifth major project on the Old Road Campus. Terry Spraggett, Mace’s Director of Public Sector Construction, said that he was proud of what the company had achieved. “The opening of the Li Ka Shing Centre is a proud moment for all of us. Although building world-class research facilities like this is always going to be a challenge, you know you’re delivering something that will have a real legacy for global health,’ he said. ‘It’s also good for Britain, helping to make sure we’re at the forefront of an international research agenda,” he added.